Crabs don’t usually appear on electric signboards at the station, so these images would be enough to stop any regular commuter dead in their tracks. However, this wasn’t the end of the surprise, as the next image to appear was a message that said, “Eat crabs in Hokuriku." And then: “Crabs are waiting." Soon after these images were posted online, some Twitter users couldn’t help but wonder if a giant crustacean had taken over the controls at the station. 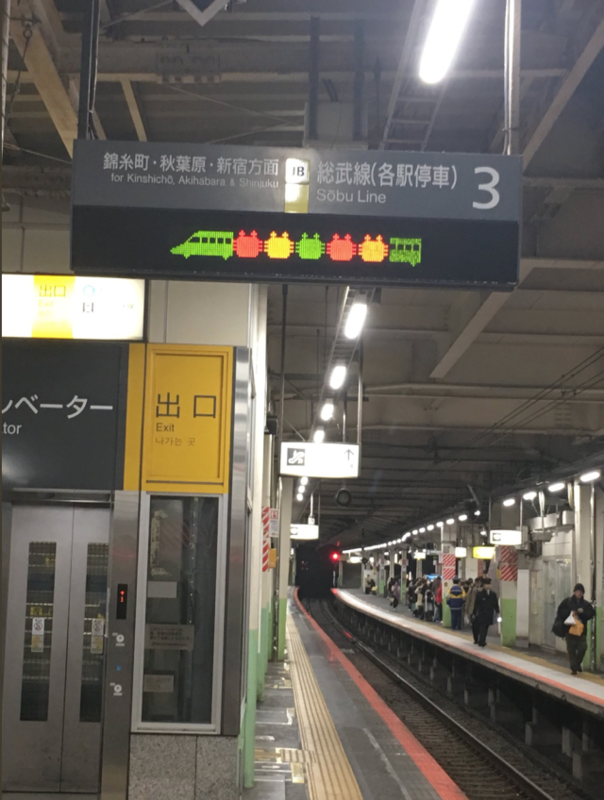 Perhaps decked out in a rail attendant’s uniform, using its giant claws to save itself and its local brethren by manipulating the display to get people hungry for crabs in the Hokuriku region of Ishikawa, Fukui, Niigata and Toyama prefectures. 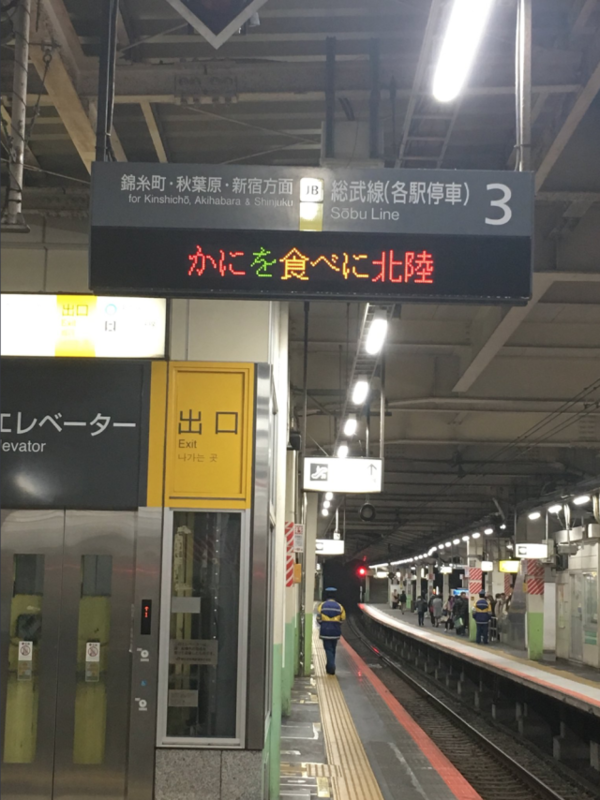 According to local commuters, though, platforms 2 and 3 at Nishi-Funabashi are only busy during the morning and evening rush hours, which is why a sign like this wouldn’t interfere with normal operations. 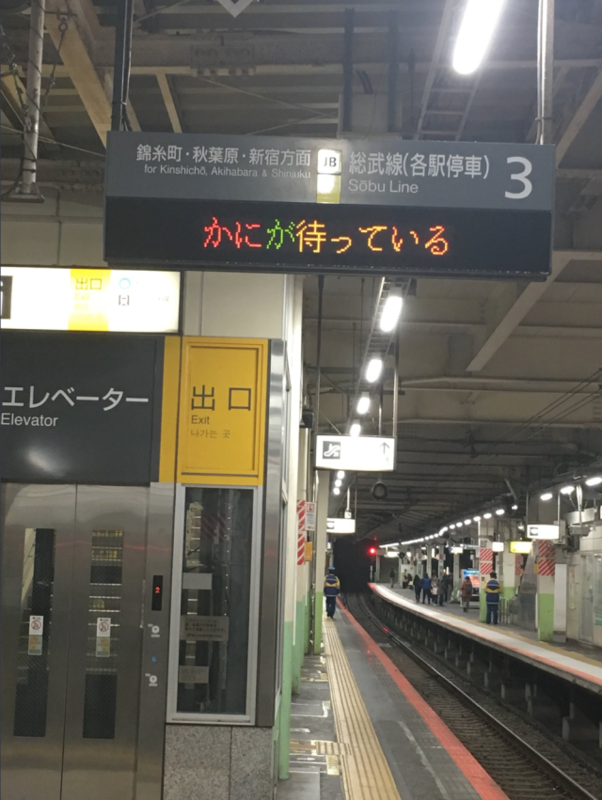 However, a number of Twitter users revealed Nishi-Funabashi Station wasn’t the only place with a severe case of crabs, as the walls of Akihabara Station in Tokyo were plastered with crustaceans as well. 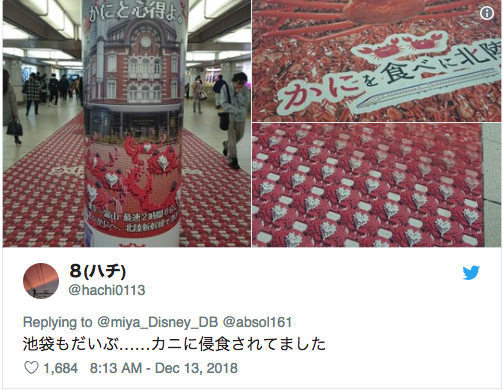 The walkway and pillars at Ikebukuro Station were also covered with bright red crabs, and these ones were carrying white love hearts. 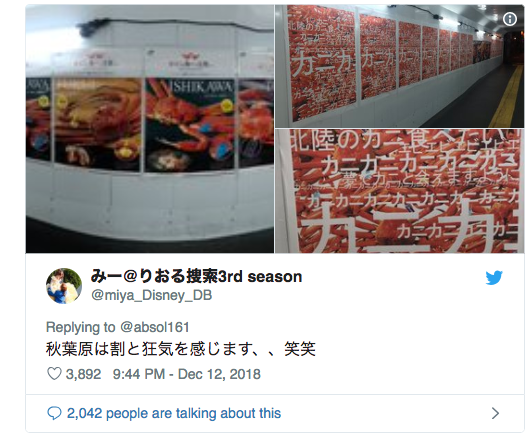 A closer look at the posters reveals that the crab craziness is all part of a special “Eat crabs in Hokuriku” campaign currently being run by East Japan Railway, in conjunction with organizations and travel companies from Hokuriku, to encourage people to enjoy the winter specialty in the region. The campaign is set to run until March 31 next year, so the crabs won’t be going anywhere anytime soon. Keep an eye out for them during your travels! -- Tottori airport serves crab soup from a faucet and… Dammit Seiji, put down that plastic bottle! Not good for the crabs though. Warning: A giant local service CRAB is quickly approaching!